And the winner of the Litigiation iPad Survival Kit Giveaway is…. ….Brian West!! Congratulations to Brian, our official winner of the Litigation iPad Survival Kit giveaway! The iPad Survival Kit was created to help us celebrate the one-year anniversary of JuryStar for iPad!!! Today we look at the iCloth screen cleaning sanitizing wipes and the Bamboo Stylus duo both up for grabs in our “Litigation iPad Survival Kit” giveaway which continues to increase in value thanks to incredible partners. Currently, our iPad Survival Kit is valued at more than $2,250. 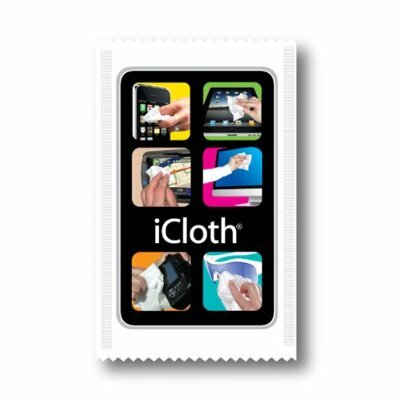 The iCloth Premium Wipes instantly sanitizes while providing a streak-free clean to your iPad touchscreen. The individually wrapped wipes come in a 40 count desktop box ($14.49 value). For the mobile legal professional, you’ll want to throw a few in your briefcase and in the car for cleaning on the go! Today we look at two very different iPad cases up for grabs in our “Litigation iPad Survival Kit” giveaway. I don’t know about you, but my wardrobe is full of lots of shoes, boots, belts, scarves, purses and brief cases. My tech closet is getting pretty propped out as well. Cords, chargers, cases, keyboards, headphones, stylus and more. Different situations require different tech props. We are pleased to have in our iPad Survival Kit giveaway two cutting-edge approaches to partner with your iPad. Last updated: Nov. 20, 2012: And the winner of the Litigiation iPad Survival Kit Giveaway is…. JuryStar Birthday inspires “Litigation iPad Survival Kit” giveaway! Litigator Technology Co-Founders Nancy and Boyd Patterson at the JuryStar App Launch Party, October 11, 2011, at the University of Tennessee at Chattanooga. ORIGINAL POST Happy 1st Birthday JuryStar! 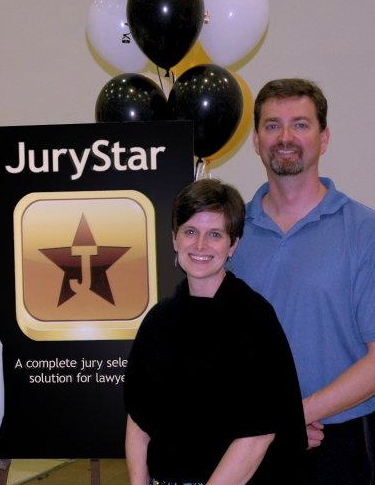 One year-ago today, my husband and I hosted an App Launch Party for JuryStar®! It has been an incredible year, and to help us celebrate this special milestone, we have created a one-of-a-kind “Litigation iPad Survival Kit” that will be given away next month to one very lucky litigator, future litigator or paralegal practicing in the United States.